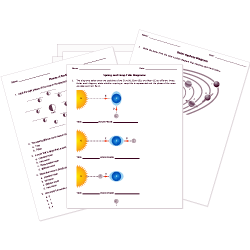 Explore the wonders of the solar system and universe using these printable astronomy worksheets. Research a planet with our graphic organizer activity or answer questions about moon phase images. Don't see a printable you need? Use our Test Maker™ to create your own printable that fits your needs. Browse astronomy questions or use our advanced search to find existing questions while filtering by grades and keywords. You can also create your own questions. Motions of Stars and Constellations new!